I don’t know about you but stress and anxiety were constant companions of mine in my 20s! And, I’ll admit it that if I’m not looking after myself properly, they can still regularly come around to visit! They popped around last week for a little visit as I was feeling under the weather and I was feeling a bit overwhelmed at the mammoth list of tasks to complete in the next few weeks. You know those thoughts you have when you can actually feel your heartbeat quicken, you feel more alert but drained at the same time, that clawing feeling in your chest and the tightness in your jaw! Well that’s when I know that anxiety and stress have popped in to say hi! At this time of year, although it’s great fun, the holidays do take your inner angst up a notch (or five). Let’s see, you’ve got: Christmas parties, family problems that escalate, cooking, sitting in traffic, shopping for gifts, spending more money than you have, getting your cards in the post in time (and often not getting them in at all! ), the vision of the Christmas that you want and then the reality of the panic attack that feel imminent … YIKES! After 4 years of coaching hundreds of women, I still feel an ache in my heart every time I hear a client say ‘I feel selfish’ when she’s talking about wanting to set boundaries with people, when she is wanting to say no to demands on her time and when she wants to do what she wants to do but doesn’t because of putting other people ahead of herself. You know you are no good to anyone else if you’re running on empty. Take care of you and make sure you invest in your own wellness. When is the last time you did something that you enjoy for you? Get it in your diary today! When you compare your life to others, you are giving up your power. Everyone is on a different path. People have wins or hardships at different points in their lives. People have difficulties they don’t share. You might think others have it better, but you don’t have the full story. It can be easy to compare your life to others with social media showcasing what everyone is doing at every minute of the day (and usually people post about the good things! ), but I have an easy trick to take your power back. Next time you begin to compare yourself to someone else, stop and compare yourself to a past version of you! Only compete with yourself to be a better you or have an improved life. How can you be a better you? Ask yourself: What’s a better thought you can choose? What’s a positive thing you can tell yourself? What are you doing right? How can you do more of that? Comparing yourself is passive and gets you nowhere. Focusing on you is active and can get you where you want to be. Keeping a journal is something I have always done- or at least something I’ve always done when I was looking after myself! Some people view journals as too touchy feely, or they have no idea where to start or what to write. The fact is however that studies have shown that putting pen to paper and releasing your thoughts is can be extremely cleansing to your soul! So, get yourself a gorgeous new journal and just start by writing out your thoughts. Over time you may find that journaling can help you process how you feel, what you think and even raise your awareness within your life! If nothing else, it gets the worry and panicky thoughts out of your head so you can have a better night sleep! Yes it sounds cheesy, yes it sounds corny, yes it sounds American but yes, it works! 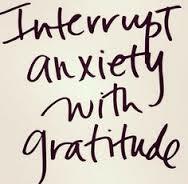 Gratitude is a word that pops up a lot around this time of year but it truly is the key to a happier and less anxious version of you! When you focus on what you have instead of what you don’t have and take time to relish in all the good things in your life, you can’t help but feel good. When you practice gratitude, you start training your brain to scan for all the wonderful things about your life and doing so improves your mood little by little. Try these steps, get proper sleep and nutrition and you’ll find that actively working to reduce your anxiety will do wonders for making you feel better! Be proactive and look after you rather than reacting and letting yourself get worked up! You love this time of year and you owe it to yourself to make it as wonderful as you can – for you! I’d love to hear some of your tips to reduce your anxiety levels! Pop over to the facebook page and let me know! Be You, be Calm and Enjoy! This entry was posted in Progress and tagged anxiety, christmas, depression, stress on December 3, 2014 by admin.